While I won’t hesitate to drop $20 on a quality chunk of dark chocolate or stinky cheese, I have a hard time passing up a good bargain. Cooking at home keeps our family’s food costs low, a fact I learned as a poor college kid developing a meal repertoire of bean burritos, fried rice, and other filling but frugal foods. Stocking up on pantry staples when they are on sale is another great cost‐cutting measure. I tell you all this as way of explaining why I decided to buy 10 pounds of dried split peas during a recent shopping trip. How could I pass them up? Organic, healthy, and less than a dollar a pound. Only during the drive home did I realize that I have only used split peas in split pea soup, a soup I like but don’t particularly love. Luckily, my trusted and now worn How To Cook Everything provided an interesting alternative to split pea soup with these fritters. 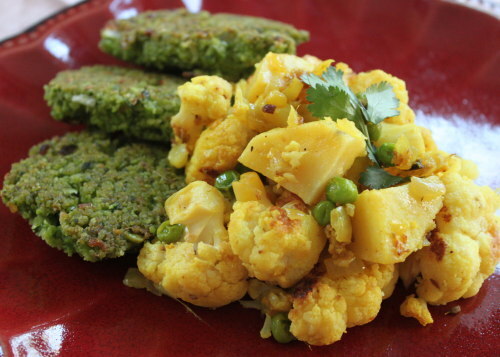 We like the split pea fritters even more than falafel, a similar but chickpea‐based fritter. If you’ve ever made falafel, you know the “batter” consistency should resemble wet sand. I think they cook best in a shallow pool of hot oil. I like them served piping hot with a cool creamy sauce like lemon‐cumin yogurt sauce or even a simple raita. Delicately spiced roasted cauliflower and potatoes round out the meal nicely. Soak the split peas in water to cover for at least 3 hours. Drain but leave them wet. Place the oil, about 1/2 inch deep, in a large, deep saucepan. Instead of pan frying, you can also deep fry these in more oil (at least 3 inches deep). Heat the oil over a medium‐high heat to about 365°F to 375°F. Place the drained peas in the container of a food processor with the chile, ginger, garlic, 1/2 onion, cilantro, coriander, cumin, and fenugreek. Process until the mixture is a coarse puree — not perfectly smooth, but with no whole peas remaining. Add a couple tablespoons of water to the mixture if necessary to help the machine work. Stir in the minced onion and salt and pepper. The mixture should be fairly loose; add a little water if it is quite thick or 1 to 2 tablespoons of flour if it’s soupy. Taste and adjust the seasoning if necessary. Drop the mixture by heaping tablespoons into the oil, but don’t crowd the pan. Cook the fritters for 2 to 3 minutes on each side or until lightly browned and crisp. Drain on paper towels. Repeat with the remaining mixture, adding (and heating) more oil to the pan if necessary. Serve the fritters hot or at room temperature with lime or lemon wedges, if desired. Put the oven rack in the upper third of the oven and place a shallow baking pan on the rack. Preheat the oven to 475°F (240°C). Toss the cauliflower and potatoes together in a bowl with 3 tablespoons oil, cumin seeds, and 1/4 teaspoon salt. Spread in the hot baking pan and roast, stirring occasionally, for about 20 minutes, until the cauliflower is tender and browned in spots and the potatoes are just tender. While the vegetables are roasting, cook the onion, garlic, jalapeño, and ginger in the remaining 2 tablespoons of oil in a 12‐inch heavy skillet over a moderate heat, stirring frequently, for 8 to 10 minutes, until very soft and beginning to turn golden. Add the ground cumin, coriander, turmeric, cayenne, and remaining 1/2 teaspoon salt and cook, stirring constantly, for 2 minutes. Stir in the water, scraping up any brown bits from the bottom of skillet, then stir in the roasted vegetables. Cook, covered, stirring occasionally, for 5 minutes.